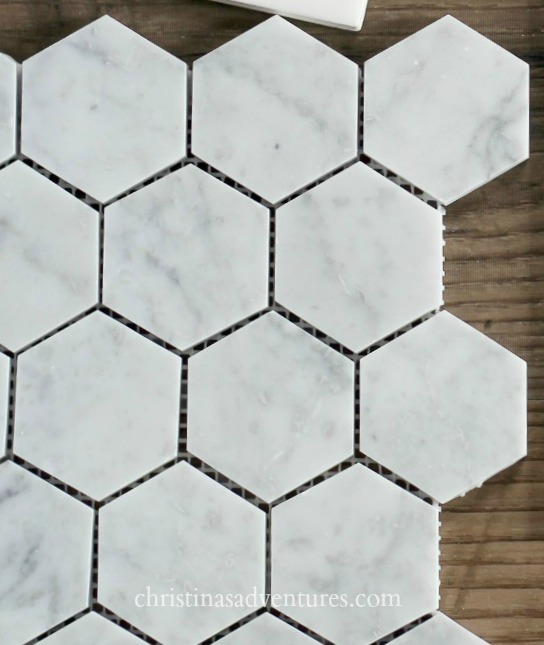 Where to buy affordable bathroom tile and ideas of how to implement them in your bathroom remodel. This is a great combination of shower tiles that’s affordable, unique and beautiful! this post contains affiliate links for your convenience – full disclosure here. EDITED TO ADD: We still love our old subway tile, but we saved time with this renovation and did smaller subway tiles we found that were sold in sheets – we LOVE THEM. You can find them here. We love our subway tile in our kitchen and our half bathroom, and will be using the same one in 3 of the 4 bathroom shower walls. We got ours from Home Depot, and they’re super inexpensive. As in, the grout will cost more than the tile itself. It’s sold by the tile, and not in sheets. 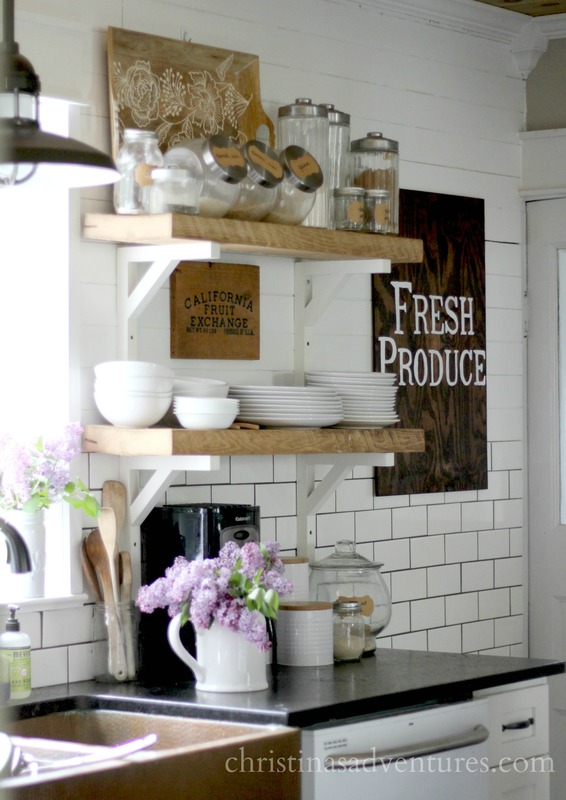 There are lots of other formats to buy subway tiles, but this was our most affordable option. We used charcoal gray grout for these rooms, but we’ll be using a light gray grout for this bathroom renovation. Click here to see exactly what kind of grout we used in our shower. 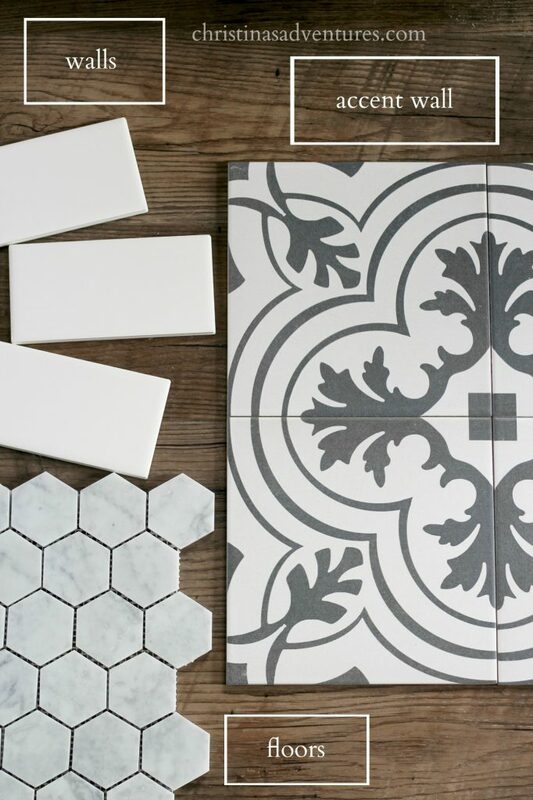 I am SO excited we were able to incorporate these tiles in our bathroom design! I was originally thinking we were going to use them on the floors in our shower, but someone pointed out to me that it wouldn’t work on the floor. And, duh, that’s absolutely correct. You shouldn’t put large tiles on the floors of a shower because of the sloping and because it’s too slippery. These tiles are 7.75″ square, and will be on a large wall in our shower. These tiles are the most expensive ones in our bathroom, but by only putting it on one wall, it helps to keep costs down. Honestly- it would be too busy to do it on all of the shower walls! The wall we’re doing is 6’x8′, and with shipping it cost about $300 for the patterned tile. So as I said…the most expensive tile in our plan, but worth it for a huge visual impact in our bathroom. You can buy these tiles a few different places – combine promo codes and free shipping deals here and you can get a pretty great deal. 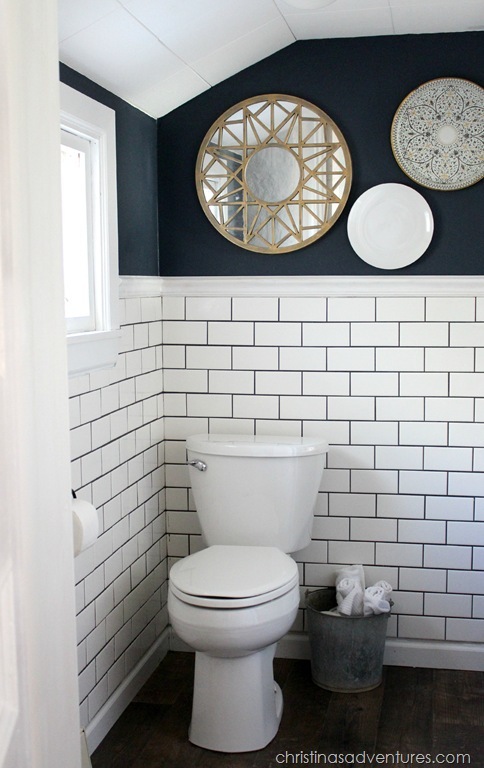 This was the biggest gamble in our bathroom – we had used the subway tiles, the patterned tiles had 100’s of positive recommendations and pictures, but this one just didn’t have as many reviews. The price point was great, the reviews it did have were also great…but it was still a gamble! Honestly? I got an e-mail from the company after I made the purchase, and then they called me to make sure they had the order correct, and the tiles were shipped and delivered really quickly. And I LOVE THEM. They’re so pretty, and they’ll be perfect for our shower floor! I am so thrilled with this purchase. You can view or buy these tiles here – we are SO happy with this purchase! 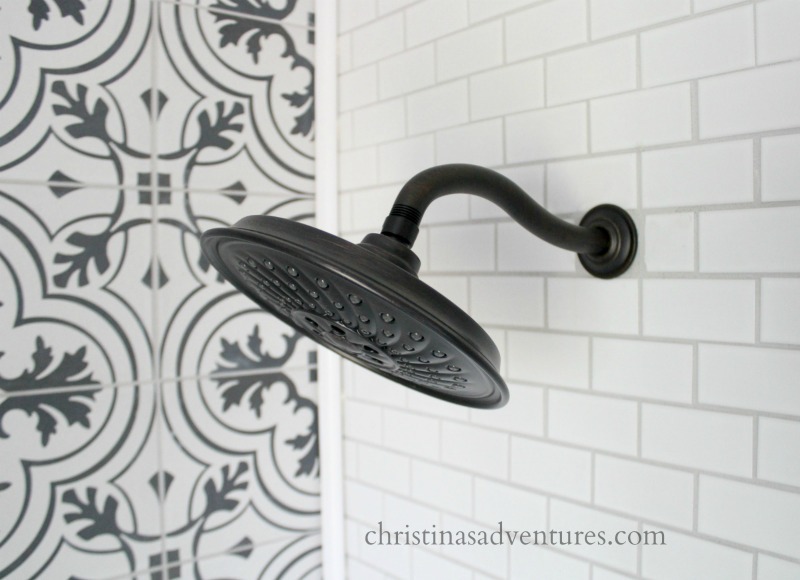 I am so happy with how these bathroom tile ideas came together in our shower! To see our FULL bathroom renovation – click here! You won’t BELIEVE the transformation! Like this post? Click here to pin it & share with others! I have recently made my home with these amazing patterned tiles. The designs are exceptional. Where did you get the Accent wall tiles? Love your style!! 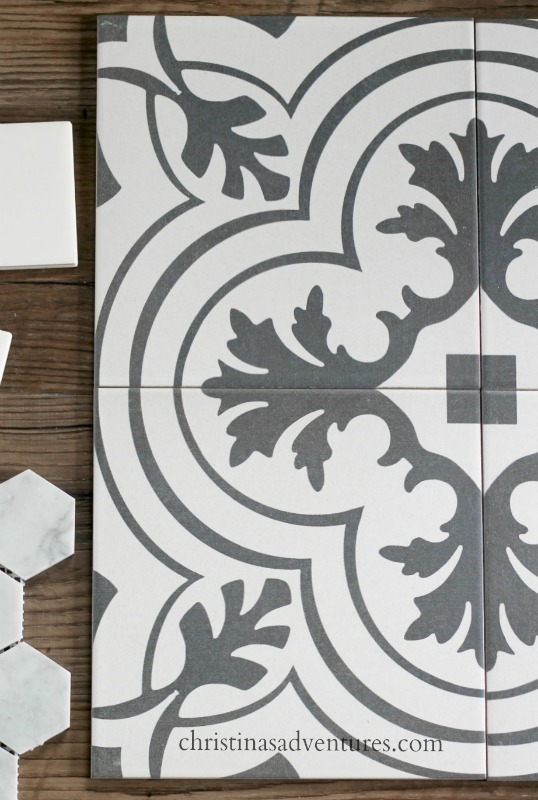 Hi – can you tell me where you found the patterned tile? The link does not work. What did you use for the grout with the pattern tile on wall? Where is the circular mirror from in the bathroom? Where is the mirror from?? I need it!